TFM Magazine is distributed in both hard copy and electronic format. The TFM Magazine subscription base has substantially increased over the past 18 months. Hard copies are delivered directly to our subscribers via courier. An electronic version is available through SA ePublications. 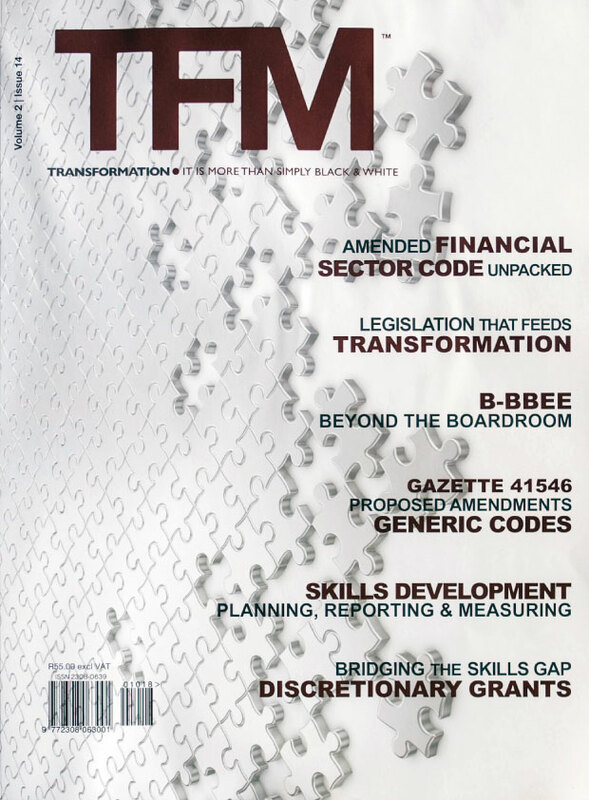 In May 2016, TFM Magazine was introduced as part of their core publications, which ensures direct access to SA ePublication’s 15,000 users and recognises TFM Magazine as a credible source of information surrounding B-BBEE and transformation. Workshops, conferences and events hosted by our media and strategic partners. Due to the continual increase in TFM Magazine distribution contact info@readtfm.co.za for the current total of magazines distributed. Although B-BBEE compliance and transformation are exceptionally niche, the audience is extremely broad. 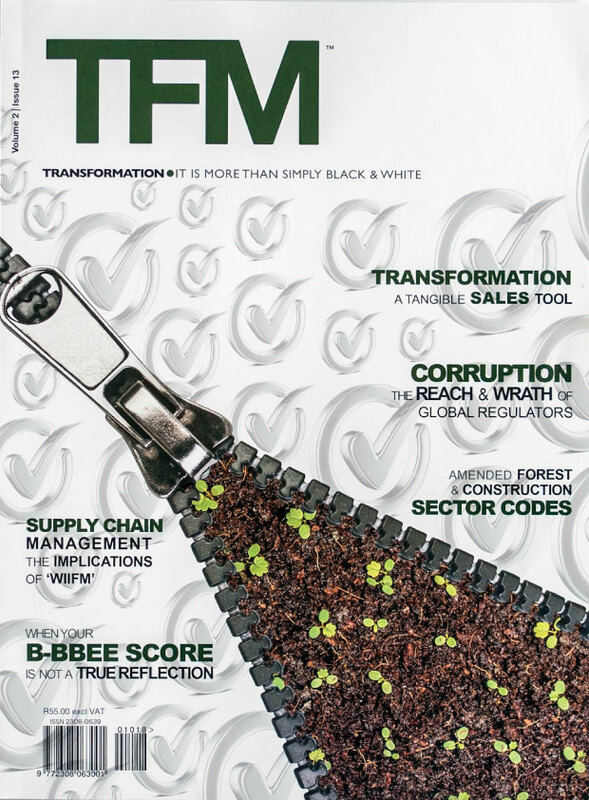 TFM Magazine distribution spans across all sectors, aimed explicitly at Transformation, Human Resources, Procurement, Training and Marketing Departments of Large Enterprises, Qualifying Small Enterprises and Exempt MicroEnterprises. Click here to see full spec sheet. As you are aware, the B-BBEE arena is rapidly becoming an oversupplied market. Although there are many organisations servicing the broader business community, with solid credentials and adequate resources that are versed in all elements of Transformation, there are others that are not. They enter the market under-skilled and under-resourced, with no ability to manage a transformation strategy end-to-end. In the worst case, ethical players in the B-BBEE arena are losing business to ‘Charlatans’ who guarantee a status level with no insight into an organisation, promote initiatives that purposefully circumvent the codes and add no value to an organisation’s long-term transformation objectives. 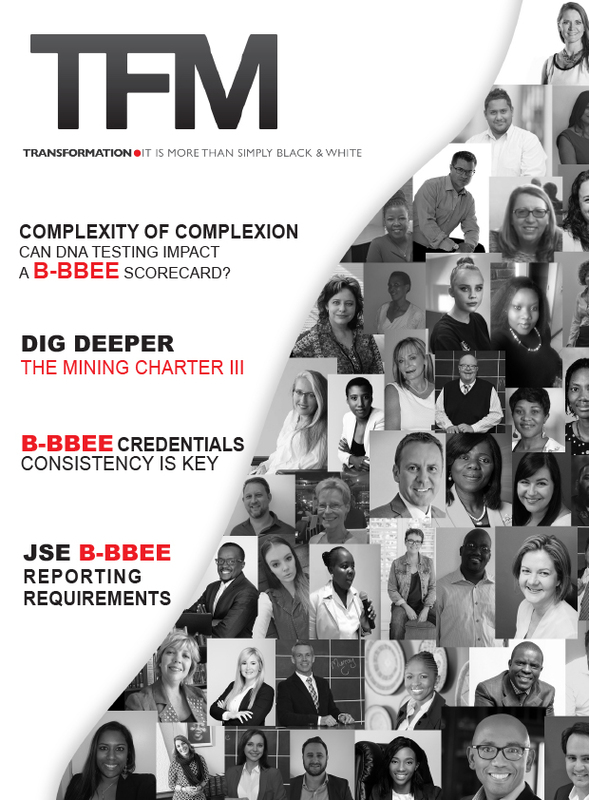 The core aim of TFM Magazine is to work together with organisations that are ethically servicing the B-BBEE needs of the broader business community with content that is relevant, factual and aligns to best practice. The intent is for the broader business community to be aware of the vast solutions available in the B-BBEE arena, which will allow them to make informed decisions when choosing a B-BBEE service provider. However, to do this, the broader business community must separate the ‘wheat from the chaff’. As an ethical player in the B-BBEE arena, I would like to offer you a platform to showcase your organisation’s credentials and expertise. It is an opportunity for you to communicate how your organisation can complement a B-BBEE Scorecard by marketing your unique service offering. As TFM Magazine readers are your direct target audience, showcasing what differentiates your organisation, the solutions on offer and your solid track record will stand you in good stead to grow your business. Transformation spans across all sectors of business with a specific impact on how an organisation allocates their procurement spend to diversify their supply chain. In essence, without communicating your investment in a Transforming South Africa, your efforts, commitment and achievements will, more often than not, not reach your prospective or current client base. We hope you join us in moving Transformation from being a prerequisite mandate to forming part of every organisation’s culture. Historically, generating new business and maintaining long-term service level agreements in the South African business arena was based on cost, delivery and solid relationships. However, in a Transforming South Africa, an organisation’s scorecard is a vital differentiating factor. 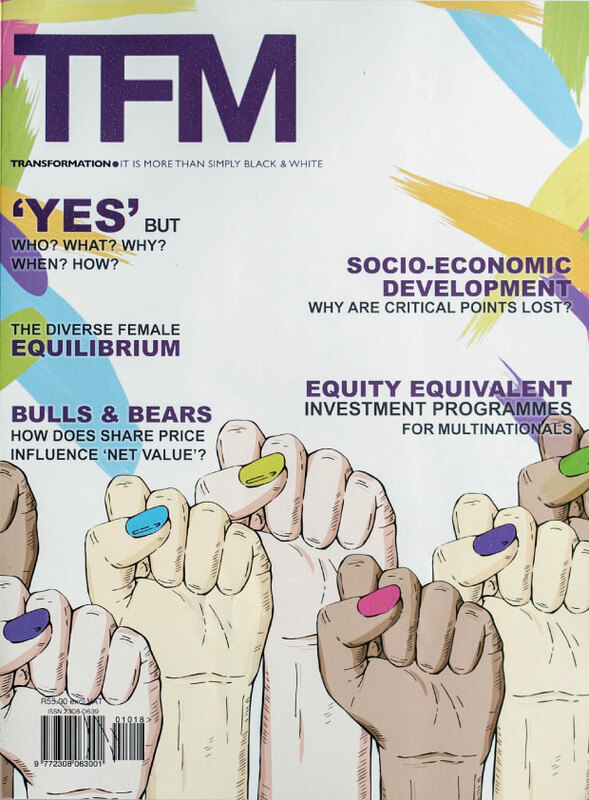 Using TFM Magazine as a platform to showcase your organisation’s Transformational milestones and commitment will not only solidify your role in a Transforming South Africa but will highlight your actual investment in Transformation to both your perspective and current client base. An additional benefit, upon meeting specific criteria, is that participating in TFM Magazine may be deemed a credible Enterprise Development, Supplier Development or Socio-Economic Development contribution.